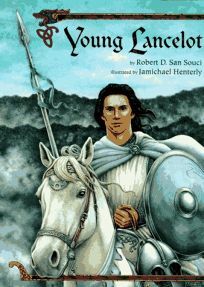 knight time Robert D. San Souci turns out the third book of his Arthurian cycle with Young Lancelot, illus. by Jamichael Henterly (see Young Guinevere, p. 78). The text is hampered by clicheed dialogue (Lancelot: ""You yourself say this is my destiny. Yet you hold me back""; his guardian: ""Oh, King's Son... it breaks my heart to part from you""), while the illustrations present expressionless, idealized figures in romantic, richly colored settings.